After making her Broadway debut as the Christine alternate and then starring alongside Broadway heavy-hitters in Hal Prince's The Prince of Broadway, Kaley Ann Voorhees is officially opera ingenue Christine Daaé in Broadway's longest-running musical The Phantom of the Opera. BroadwayBox caught up with Kaley to talk about the Christine sisterhood, great advice from Hal Prince, and her favorite moments with her Phantom and Raoul. 1. You’ve done two runs on Broadway as the Christine alternate. What was the biggest surprise or change for you when you took over Christine full-time? I would say the biggest difference is in the stamina. I had been there as the alternate for a while and I loved doing the two-show. I had so much fun with it and I got to know the show really well. My show has stayed pretty consistent, but the difference between singing that part two times a week and six times a week took the most adjustment. When you’re the alternate, you get recovery days, but in my case, doing six a week, recovery days aren’t really a thing. You have to learn how to produce sound in a more efficient way. 2. Having worked with Phantom director Hal Prince on Prince of Broadway, what’s the most striking thing he’s said to you about Christine? I love him so much! Hal is the type of director where his whole perspective comes from what the audience sees and what reads to the audience. There were times I would start to give my justification for a look or the way I sang a line, and he used to say, “If you can’t explain it to me in 30 seconds, then pick a different route. Because if I can’t understand it in 30 seconds, the audience won’t either.” That was something he really changed in me as an actor. It really simplified my acting choices and made my Christine a lot clearer. It boiled it down to a truer form and I think that reads better for audiences. 3. With Phantom being the longest running show on Broadway, is there a sisterhood of Christines? Do you share stories and advice? Oh absolutely! I don’t think I’ve ever met a Christine I haven’t had brunch with. It is very much a club. So many people have played it and, surprisingly, I’ve never met a Christine I haven’t gotten along with. We all have different stories and a lot of times when I see other Christines it turns into a moment to reminisce or talk about the Phantoms or Raouls we’ve played opposite of. Whenever a new Christine comes in, they are immediately accepted into the ranks, and everyone has their tidbit of advice they want to pass on. It’s really wonderful, and I truly didn’t expect it to be that way. 4. Speaking of your Phantom and Raoul, what’s your favorite moment in the show with Ben Crawford and with Jay Armstrong Johnson? I really like doing Managers [Office] II with Jay and “Twisted” and all that. I think that scene really furthers Christine and Raoul’s relationship, and it’s not necessarily the one that everyone thinks of (“All I Ask of You”). Then with Ben, it has to be “Music of the Night” because I don’t have to sing anything. I just get to stand there and take in the stage and the audience and react with him. It’s always been a great moment with the Phantoms, but especially with Ben. 5. You’re a big RuPaul’s Drag Race fan. If u could stunt cast Carlotta and Christine as Ru Girls, who would you pick as each? Let’s say they can lipsync to track to make it easier. For Carlotta, I would love see Bianca Del Rio. The energy would be so funny. For Christine, I wouldn’t mind a singer who could turn out some notes, so Adore Delano or Courtney Act. 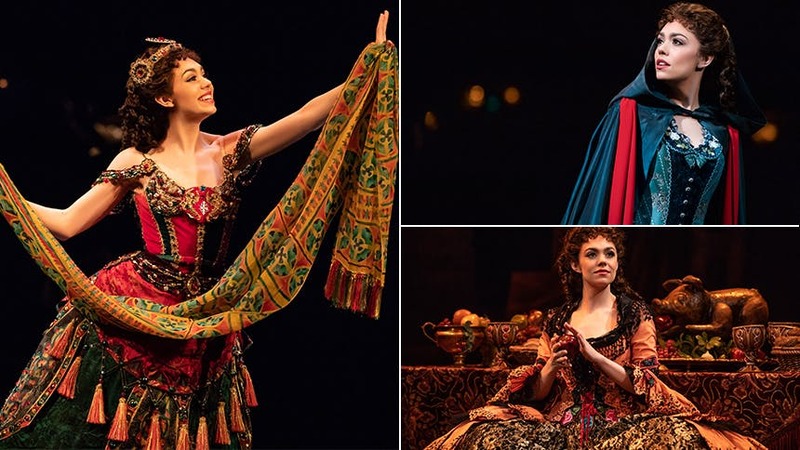 Don't miss Kaley Ann Voorhees and her stunning Christine Daae in 'The Phantom of the Opera' at Broadway's Majestic Theatre.